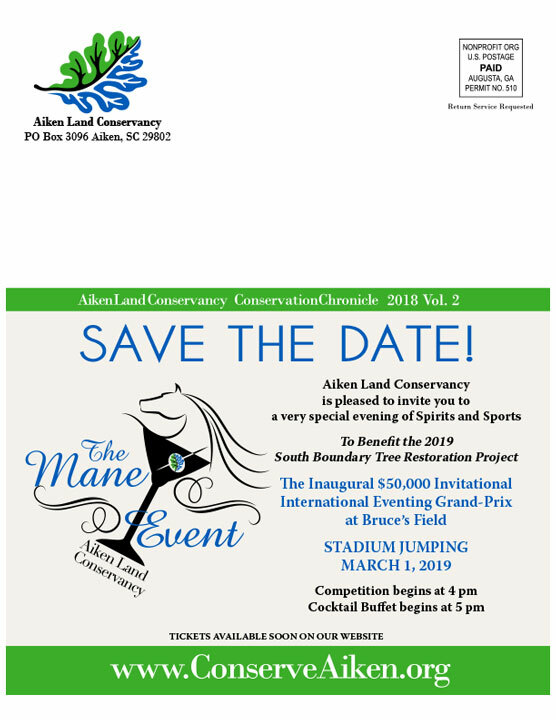 Aiken Land Conservancy (ALC) is pleased to announce it is applying for accreditation by the national Land Trust Accreditation Commission. The land trust accreditation program recognizes land conservation organizations that meet national quality standards for protecting important natural places and working lands forever. The Land Trust Accreditation Commission, an independent program of the Land Trust Alliance, conducts an extensive review of each applicant’s policies and programs. The process is well worth the effort. The accreditation seal is a recognizable mark of distinction in land conservation. It will prove to past and future donors that ALC has the sophistication, resources and integrity to protect its assets against potential future challenges. In addition, in an area where public and private funds are shrinking and tax deductions are subject to intensified scrutiny, the land trust accreditation seal will promote continued public confidence and ensure ALC’s continued vitality and success. The Commission invites public input and accepts signed, written comments on pending applications. Comments must relate to how Aiken Land Conservancy complies with national quality standards. These standards address the ethical and technical operation of a land trust. For the full list of standards see http://www.landtrustaccreditation.org/tips-and-tools/indicator-practice. To learn more about the accreditation program and to submit a comment, visit www.landtrustaccreditation.org, or email your comment to info@landtrustaccreditation.org. Comments may also be faxed or mailed to the Land Trust Accreditation Commission, Attn: Public Comments: (fax) 518-587-3183; (mail) 36 Phila Street, Suite 2, Saratoga Springs, NY 12866. Comments on Aiken Land Conservancy’s application will be most useful by November 1, 2015.